Mary, the mother of Jesus, sits slumped in grief against a wall, holding the bloody crown of thorns. 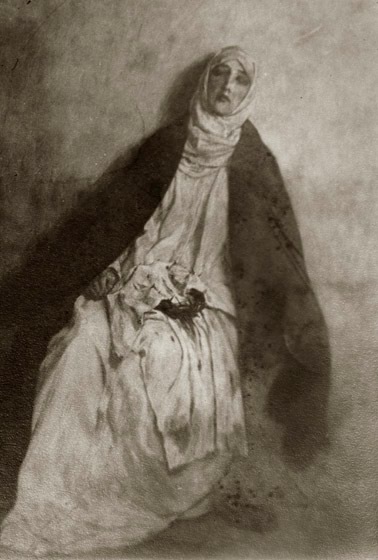 Although it is difficult to tell in the photograph, it appears that blood not only stains her robe, but some has fallen on the ground as well. Trego's portrayal of blood is very rare, even in his military paintings. Its appearance here is likely a sign of his own religious feelings and his desire to convey a strong religious message. We know from his 1887 letters to his friend Helen Merrick that Trego had deep-seated religious beliefs. There is also a report that in the last years before his death, William Trego joined the Reformed Church in North Wales. His several religious works date from that same period of time. The painting is only known from this photograph in the Trego files at the Spruance Library of the Bucks County Historical Society in Doylestown, Pennsylvania. It was donated by Eva Frank, an artist of North Wales, who had obtained it from another North Wales resident, Rosalind Smith, in the 1950s. Displayed in the Wanamaker's Department Story in Philadelphia for many years before 1954.